Vienna is the capital of Austria, and also one of the nine States of Austria. Vienna is Austria's primate city; with a population of about 1.7 million (2.2 million within the metropolitan area), and is by far the largest city in Austria as well as its cultural, economic and political centre. 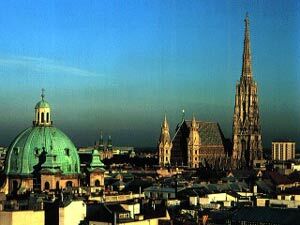 Vienna lies in the very east of Austria and is close to the Czech Republic, Slovakia and Hungary. In 2001, the city centre was designated a UNESCO World Heritage Site and the city ranks third in the world in terms of quality of life. Vienna's cultural life is multi-faceted. You have the choice of 50 theatres, four opera houses, two stages for musicals, 100 museums and numerous theatre, music and dance festivals. The Museumsquartier (museum quarter) with its baroque facade is home to one of the biggest cultural districts in Europe. Vienna is known worldwide as a city of music. Quality orchestras and ensembles are its seal of excellence. Along with well-established ensembles for contemporary music classical music continues to play a vital role, as made evident by the City of Vienna Concert Orchestra and the Vienna Symphony Orchestra, amongst others. The Vienna Academy, the Vienna Chamber Orchestra and the Women's Chamber Orchestra are dedicated to tradition and modern music alike. International artists are a great gain to cultural life in Vienna. Environmentally, Vienna is a model city as it meets all the relevant criteria applying for instance to water supply and waste water management, waste disposal, clean air management and the city’s overall ecological balance. One third of Vienna’s entire urban area is made up of conservation areas, protected landscapes, a national park and similar protection initiatives. Vienna ranks among the cities with the best quality of life not least because of its good air quality. In order to uphold the high standard, the project "Urbane Luft Initiative - Wien (ULI)" (Urban Air Initiative – Vienna) has a clear focus on reducing the air’s fine dust load and the concentration in nitric oxides. Bruxelles Belgium based company offers online services such as hotel bookings to several cities in Europe including Vienna. More than 40 properties listed on our Vienna hotels guide and also a selection of apartments for short or long term rentals. First Vienna Hotels offers accommodation at hotels in Vienna. The reservation system proposes low & discount rates, real time secure reservation, instant confirmation, free cancellation. Online hotel booking system for Vienna and Austria. Find cheap or luxury hotel, apartments and pensions in Vienna.